Korean electronics giant Samsung is hoping to more than quadruple its sales of mirrorless interchangeable lens cameras this year, in a bid to compete with bigger Japanese rivals. More and more Japanese manufacturers have introduced compact system cameras in the past few years, including Sony, Olympus, Pentax and most recently Fujifilm with its X Pro 1. So far, these have had mixed successes, but it is clear that it's a sector of the market that is growing all the time, and it looks likely that 2012 will see even more of these cameras released on to the market. 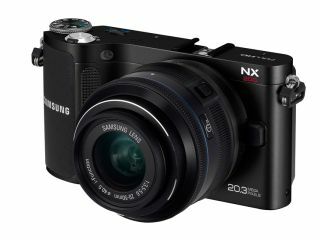 Samsung was the third company to enter the fray, back in the beginning of 2010 with the NX10, which was the first camera of its kind to use a large APS-C sized sensor. The company has been showcasing its latest imaging products at CES in Las Vegas, during which it told Reuters that it was hoping to boost its mirrorless sales this year, up from 120,000 to a massive 500,000. It's also hoping to grow the accessories market, which includes lenses. Earlier in the week, Samsung told TechRadar it was considering producing a more advanced mirrorless model in order to appeal to professional photographers. At present, the camera sector of Samsung is one of its smallest operations, but the firm aims to swell the division to be in line with its more successful television and smartphone units. Although the company faces tough competition from the Japanese giants, it does have the advantage of a deep electronics technology pool that it can draw from, meaning it can offer greater compatibility between different types of device. Compact system cameras are mainly popular in Japan, accounting for almost a third of interchangeable lens models sold in the country in 2010. They have been slower to take off in Europe and the US however. Currently, Samsung owns 2% of the global interchangeable lens market, which is dominated by Canon, Nikon and Sony.